This article is about the scientific field of forestry. For the American racehorse, see Forestry (horse). The preindustrial age has been dubbed by Werner Sombart and others as the 'wooden age', as timber and firewood were the basic resources for energy, construction and housing. The development of modern forestry is closely connected with the rise of capitalism, economy as a science and varying notions of land use and property. Roman Latifundiae, large agricultural estates, were quite successful in maintaining the large supply of wood that was necessary for the Roman Empire. Large deforestations came with respectively after the decline of the Romans. However already in the 5th century, monks in the then Byzantine Romagna on the Adriatic coast, were able to establish stone pine plantations to provide fuelwood and food. This was the beginning of the massive forest mentioned by Dante Alighieri in his 1308 poem Divine Comedy. 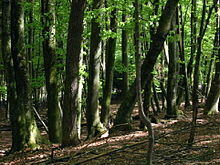 In Europe, land usage rights in medieval and early modern times allowed different users to access forests and pastures. Plant litter and resin extraction were important, as pitch (resin) was essential for the caulking of ships, falking and hunting rights, firewood and building, timber gathering in wood pastures, and for grazing animals in forests. The notion of "commons" (German "Allmende") refers to the underlying traditional legal term of common land. The idea of enclosed private property came about during modern times. However, most hunting rights were retained by members of the nobility which preserved the right of the nobility to access and use common land for recreation, like fox hunting. Systematic management of forests for a sustainable yield of timber began in Portugal in the 13th century when Afonso III of Portugal planted the Pinhal do Rei near Leiria to prevent coastal erosion and soil degradation, and as a sustainable source for timber used in naval construction. His successor Dom Dinis continued the practice and the forest exists still today. Forest management also flourished in the German states in the 14th century, e.g. in Nuremberg, and in 16th-century Japan. Typically, a forest was divided into specific sections and mapped; the harvest of timber was planned with an eye to regeneration. As timber rafting allowed for connecting large continental forests, as in south western Germany, via Main, Neckar, Danube and Rhine with the coastal cities and states, early modern forestry and remote trading were closely connected. Large firs in the black forest were called „Holländer“, as they were traded to the Dutch ship yards. Large timber rafts on the Rhine were 200 to 400m in length, 40m in width and consisted of several thousand logs. The crew consisted of 400 to 500 men, including shelter, bakeries, ovens and livestock stables. Timber rafting infrastructure allowed for large interconnected networks all over continental Europe and is still of importance in Finland. Starting with the sixteenth century, enhanced world maritime trade, a boom in housing construction in Europe and the success and further Berggeschrey (rushes) of the mining industry increased timber consumption sharply. The notion of 'Nachhaltigkeit', sustainability in forestry, is closely connected to the work of Hans Carl von Carlowitz (1645–1714), a mining administrator in Saxony. His book Sylvicultura oeconomica, oder haußwirthliche Nachricht und Naturmäßige Anweisung zur wilden Baum-Zucht (1713) was the first comprehensive treatise about sustainable yield forestry. In the UK, and, to an extent, in continental Europe, the enclosure movement and the clearances favored strictly enclosed private property. The Agrarian reformers, early economic writers and scientists tried to get rid of the traditional commons. At the time, an alleged tragedy of the commons together with fears of a Holznot, an imminent wood shortage played a watershed role in the controversies about cooperative land use patterns. The practice of establishing tree plantations in the British Isles was promoted by John Evelyn, though it had already acquired some popularity. Louis XIV's minister Jean-Baptiste Colbert's oak Forest of Tronçais, planted for the future use of the French Navy, matured as expected in the mid-19th century: "Colbert had thought of everything except the steamship," Fernand Braudel observed. In parallel, schools of forestry were established beginning in the late 18th century in Hesse, Russia, Austria-Hungary, Sweden, France and elsewhere in Europe. During the late 19th and early 20th centuries, forest preservation programs were established in British India, the United States, and Europe. Many foresters were either from continental Europe (like Sir Dietrich Brandis), or educated there (like Gifford Pinchot). Sir Dietrich Brandis is considered the father of tropical forestry, European concepts and practices had to be adapted in tropical and semi arid climate zones. The development of plantation forestry was one of the (controversial) answers to the specific challenges in the tropical colonies. The enactment and evolution of forest laws and binding regulations occurred in most Western nations in the 20th century in response to growing conservation concerns and the increasing technological capacity of logging companies. Tropical forestry is a separate branch of forestry which deals mainly with equatorial forests that yield woods such as teak and mahogany. Schweizerische Zeitschrift für Forstwesen first published in 1850. The Indian Forester first published in 1875. Šumarski list (Forestry Review, Croatia) was published in 1877 by Croatian Forestry Society. Montes (Forestry, Spain) first published in 1877. Forestry Quarterly, first published in 1902 by the New York State College of Forestry. Today a strong body of research exists regarding the management of forest ecosystems and the genetic improvement of tree species and varieties. Forestry studies also include the development of better methods for the planting, protecting, thinning, controlled burning, felling, extracting, and processing of timber. One of the applications of modern forestry is reforestation, in which trees are planted and tended in a given area. Trees provide numerous environmental, social and economic benefits for people. In many regions the forest industry is of major ecological, economic, and social importance. Third-party certification systems that provide independent verification of sound forest stewardship and sustainable forestry have become commonplace in many areas since the 1990s. These certification systems developed as a response to criticism of some forestry practices, particularly deforestation in less-developed regions along with concerns over resource management in the developed world. Some certification systems[which?] are criticized[by whom?] for primarily acting as marketing tools and for lacking in their claimed independence. In topographically severe forested terrain, proper forestry is important for the prevention or minimization of serious soil erosion or even landslides. In areas with a high potential for landslides, forests can stabilize soils and prevent property damage or loss, human injury, or loss of life. Public perception of forest management has become controversial, with growing public concern over perceived mismanagement of the forest and increasing demands that forest land be managed for uses other than for pure timber production, for example: indigenous rights, recreation, watershed management, and preservation of wilderness, waterways and wildlife habitat. Some of the advantages and disadvantages accruing to monoculture in farming also apply to monoculture in forestry. Sharp disagreements over the role of forest fires, logging, motorized recreation and other issues drive debate while the public demand for wood products continues to increase. Foresters work for the timber industry, government agencies, conservation groups, local authorities, urban parks boards, citizens' associations, and private landowners. The forestry profession includes a wide diversity of jobs, with educational requirements ranging from college bachelor's degrees to PhDs for highly specialized work. Industrial foresters plan forest regeneration starting with careful harvesting. Urban foresters manage trees in urban green spaces. Foresters work in tree nurseries growing seedlings for woodland creation or regeneration projects. Foresters improve tree genetics. Forest engineers develop new building systems. Professional foresters measure and model the growth of forests with tools like geographic information systems. Foresters may combat insect infestation, disease, forest and grassland wildfire, but increasingly allow these natural aspects of forest ecosystems to run their course when the likelihood of epidemics or risk of life or property are low. Increasingly, foresters participate in wildlife conservation planning and watershed protection. Foresters have been mainly concerned with timber management, especially reforestation, maintaining forests at prime conditions, and fire control. Foresters develop and implement forest management plans relying on mapped resource inventories showing an area's topographical features as well as its distribution of trees (by species) and other plant cover. Plans also include landowner objectives, roads, culverts, proximity to human habitation, water features and hydrological conditions, and soils information. Forest management plans typically include recommended silvicultural treatments and a timetable for their implementation. Application of digital maps in Geographic Informations systems (GIS) that extracts and integrates different information about forest terrains, soil type and tree covers, etc. using, e.g. laser scanning, enhances forest management plans in modern systems. Forest management plans include recommendations to achieve the landowner's objectives and desired future condition for the property subject to ecological, financial, logistical (e.g. access to resources), and other constraints. On some properties, plans focus on producing quality wood products for processing or sale. Hence, tree species, quantity, and form, all central to the value of harvested products quality and quantity, tend to be important components of silvicultural plans. Good management plans include consideration of future conditions of the stand after any recommended harvests treatments, including future treatments (particularly in intermediate stand treatments), and plans for natural or artificial regeneration after final harvests. The objectives of landowners and leaseholders influence plans for harvest and subsequent site treatment. In Britain, plans featuring "good forestry practice" must always consider the needs of other stakeholders such as nearby communities or rural residents living within or adjacent to woodland areas. Foresters consider tree felling and environmental legislation when developing plans. Plans instruct the sustainable harvesting and replacement of trees. They indicate whether road building or other forest engineering operations are required. Agriculture and forest leaders are also trying to understand how the climate change legislation will affect what they do. The information gathered will provide the data that will determine the role of agriculture and forestry in a new climate change regulatory system. Over the past centuries, forestry was regarded as a separate science. With the rise of ecology and environmental science, there has been a reordering in the applied sciences. In line with this view, forestry is a primary land-use science comparable with agriculture. Under these headings, the fundamentals behind the management of natural forests comes by way of natural ecology. Forests or tree plantations, those whose primary purpose is the extraction of forest products, are planned and managed utilizing a mix of ecological and agroecological principles. The provenance of forest reproductive material used to plant forests has great influence on how the trees develop, hence why it is important to use forest reproductive material of good quality and of high genetic diversity. The term, genetic diversity describe differences in DNA sequence between individuals as distinct from variation caused by environmental influences. The unique genetic composition of an individual (its genotype) will determine its performance (its phenotype) at a particular site. Genetic diversity is needed to maintain the vitality of forests and to provide resilience to pests and diseases. Genetic diversity also ensures that forest trees can survive, adapt and evolve under changing environmental conditions. Furthermore, genetic diversity is the foundation of biological diversity at species and ecosystem levels. Forest genetic resources are therefore important to consider in forest management. Genetic diversity in forests is threatened by forest fires, pests and diseases, habitat fragmentation, poor silvicultural practices and inappropriate use of forest reproductive material. Furthermore, the marginal populations of many tree species are facing new threats due to climate change. Most countries in Europe have recommendations or guidelines for selecting species and provenances that can be used in a given site or zone. The first dedicated forestry school was established by Georg Ludwig Hartig at Hungen in the Wetterau, Hesse, in 1787, though forestry had been taught earlier in central Europe, including at the University of Giessen, in Hesse-Darmstadt. In Spain, the first forestry school was the Forest Engineering School of Madrid (Escuela Técnica Superior de Ingenieros de Montes), founded in 1844. The first in North America, the Biltmore Forest School was established near Asheville, North Carolina, by Carl A. Schenck on September 1, 1898, on the grounds of George W. Vanderbilt's Biltmore Estate. Another early school was the New York State College of Forestry, established at Cornell University just a few weeks later, in September 1898. Early 19th century North American foresters went to Germany to study forestry. Some early German foresters also emigrated to North America. In South America the first forestry school was established in Brazil, in Viçosa, Minas Gerais, in 1962, and moved the next year to become a faculty at the Federal University of Paraná, in Curitiba. Today, forestry education typically includes training in general biology, ecology, botany, genetics, soil science, climatology, hydrology, economics and forest management. Education in the basics of sociology and political science is often considered an advantage. Professional skills in conflict resolution and communication are also important in training programs. In India, forestry education is imparted in the agricultural universities and in Forest Research Institutes (deemed universities). Four year degree programmes are conducted in these universities at the undergraduate level. Masters and Doctorate degrees are also available in these universities. In the United States, postsecondary forestry education leading to a Bachelor's degree or Master's degree is accredited by the Society of American Foresters. In Canada the Canadian Institute of Forestry awards silver rings to graduates from accredited university BSc programs, as well as college and technical programs. In many European countries, training in forestry is made in accordance with requirements of the Bologna Process and the European Higher Education Area. The International Union of Forest Research Organizations is the only international organization that coordinates forest science efforts worldwide. ^ "SAFnet Dictionary | Definition For [forestry]". Dictionaryofforestry.org. 2008-10-22. Archived from the original on 2013-10-19. Retrieved 2014-03-15. ^ "Seed Origin - Forestry Focus". Forestry Focus. Retrieved April 5, 2018. ^ Young, Raymond A. (1982). Introduction to Forest Science. John Wiley & Sons. p. ix. ISBN 978-0-471-06438-1. ^ "ecosystem part of biosphere". Tutorvista.com. Archived from the original on 2013-11-11. Retrieved 2014-03-15. ^ "How does the forest industry contribute to the economy?". www.nrcan.gc.ca. Retrieved April 5, 2018. ^ a b c T. Mirov, Nicholas; Hasbrouck, Jean (1976). "6". The story of pines. Bloomington and London: Indiana University Press. p. 111. ISBN 978-0-253-35462-4. ^ H. V. Livermore (2004). Portugal: A Traveller's History. Boydell Press. p. 15. ISBN 978-1-84383-063-4. Archived from the original on 2017-12-11. ^ "PGF - Mata Nacional de Leiria — ICNF". www.icnf.pt. ^ Buttinger, Sabine (2013). "Idee der Nachhaltigkeit" [The Idea of Sustainability]. Damals (in German). 45 (4): 8. ^ "Forestry in Yashino". City of Nara, Nara. Archived from the original on 2011-06-28. Retrieved 2010-10-12. ^ Braudel, Fernand (1979). The Wheels of Commerce: Civilization and Capitalism: 15th-18th Century (Volume II). University of California Press. p. 240. ISBN 978-0-520-08115-4. ^ "Swiss Forestry Society". www.szf-jfs.org. ^ "indianforester.org". indianforester.org. Archived from the original on 2013-05-17. Retrieved 2014-03-15. ^ "Revista Montes, with 12.944 free downloadable digital files from 1868". Revistamontes.net. Archived from the original on 2013-11-27. Retrieved 2014-03-15. ^ "Časopis". SCIndeks. Archived from the original on 2013-12-12. Retrieved 2014-03-15. ^ "Udruženje šumarskih inženjera i tehničara Srbije - Istorijat". Srpskosumarskoudruzenje.org.rs. Archived from the original on 2013-12-12. Retrieved 2014-03-15. ^ "Department of environmental conservation". New York State Department. Archived from the original on 2015-02-21. Retrieved 2014-11-29. ^ a b "PowerSearch Logout". Find.galegroup.com. Archived from the original on 2013-05-10. Retrieved 2014-03-15. ^ Wojtkowski, Paul A. (2002) Agroecological Perspectives in Agronomy, Forestry and Agroforestry. Science Publishers Inc., Enfield, NH, 356p. ^ Wojtkowski, Paul A. (2006) Undoing the Damage: Silviculture for Ecologists and Environmental Scientists. Science Publishers Inc., Enfield, NH, 313p. ^ "News of the world". Unasylva. FAO. 23 (3). 1969. Archived from the original on 2010-04-27. Retrieved 2010-10-12. ^ Sample, V. A.; Bixler, R. P.; McDonough, M. H.; Bullard, S. H.; Snieckus, M. M. (July 16, 2015). "The Promise and Performance of Forestry Education in the United States: Results of a Survey of Forestry Employers, Graduates, and Educators". Journal of Forestry. 113 (6): 528–537. doi:10.5849/jof.14-122. ^ "SAF Accredited and Candidate Forestry Degree Programs" (PDF) (Press release). Society of American Foresters. 2008-05-19. Archived from the original (PDF) on 2009-02-26. The Society of American Foresters grants accreditation only to specific educational curricula that lead to a first professional degree in forestry at the bachelor's or master's level. ^ "Canadian Institute of Forestry - Silver Ring Program". Cif-ifc.org. Archived from the original on 2014-02-01. Retrieved 2014-03-15. ^ "Discover IUFRO:The Organization". IUFRO. Archived from the original on 2010-07-08. Retrieved 2010-10-12. Eyle, Alexandra. 1992. Charles Lathrop Pack: Timberman, Forest Conservationist, and Pioneer in Forest Education. Syracuse, NY: ESF College Foundation and College of Environmental Science and Forestry. Distributed by Syracuse University Press. Available: Google books. Hammond, Herbert. 1991. Seeing the Forest Among the Trees. Winlaw/Vancouver: Polestar Press, 1991. Kimmins, Hammish. 1992. Balancing Act: Environmental Issues in Forestry. Vancouver: University of British Columbia Press. Maser, Chris. 1994. Sustainable Forestry: Philosophy, Science, and Economics. DelRay Beach: St. Lucie Press. Miller, G. Tyler. 1990. Resource Conservation and Management. Belmont: Wadsworth Publishing. Nyland, Ralph D. 2007. Silviculture: Concepts and Applications. 2nd ed. Prospect Heights: Waveland Press. Stoddard, Charles H. 1978. Essentials of Forestry. New York: Ronald Press.
. Vira, B. et al. 2015. Forests and Food: Addressing Hunger and Nutrition Across Sustainable Landscapes. Cambridge: Open Book Publishers. This page was last edited on 10 April 2019, at 01:09 (UTC).